What do you get when you mix 16 years of recruiting, an education in family and children studies, a pending Masters in Psychology, and a deep desire to help people achieve their highest purpose? 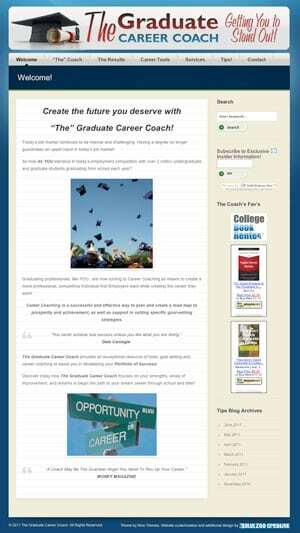 You get a newly relaunched “The” Graduate Career Coach from President & Chief Coach, Alison Nail. How can I thank you enough?! You have made my job easier, more FUN and profitable! I am an entrepreneur by heart and started my own Career Coaching business almost a year ago. I built my own website by using one of those ‘build-your-own-website-its-so-easy” sites out of desperation because I knew I needed and wanted a website for my clients. I received no traffic and honestly, it looked like a desperate, unorganized website – which translated to my customer – “desperate and organized”. So…I handed over the website reigns to you and your team. Within three months of Blue Zoo’s consulting and re-designing my website, my business has increased by 50% – within THREE MONTHS! Several of the prestigious university career centers, I contract with, commented on how user-friendly and easy it was to navigate around my website. Multiple clients (individuals and universities) also shared that my site was straight-forward, fresh and a lot of fun to read. I get to focus on my passion, Career Coaching and writing, while Blue Zoo focuses on my website. I know with every certainty, if it hadn’t been for you and your team, rockin’ up my website – my business would not be where it is today. I am excited to see the results I have already experienced and the future profits heading my way! If you have a soon-to-be graduate in your life, who may be looking for some career direction, contact (or have them contact) “The” Graduate Career Coach today! Her clients even have rave reviews. Her insight as a coach is dead-on in the most practical and down to earth ways. There are a lot of people who say there are a coach, but Alison lives those ideals in her own life and the lives of the people that she touches. One word of warning: She can intuitively see where you are holding back in life and can spot your self-sabotage from a mile a way. So, if you hire her, you had better be ready, really ready to transform. We’re proud to welcome “The” Graduate Career Coach into our managerie.